I decided to change my outdoor tank setup... again. 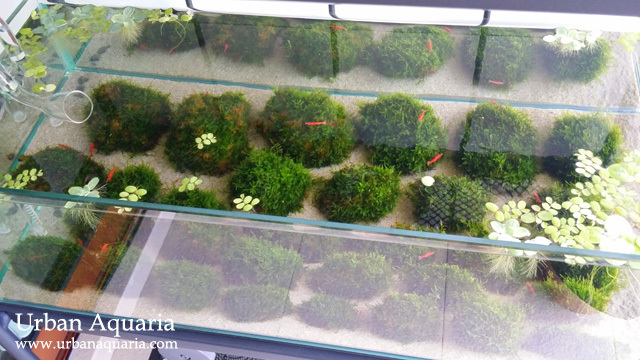 This time round i'm preparing plant decor in advance for an upcoming aquascape project, so the tank was converted into a simple moss grow-out tank. Thin layers of christmas moss were tied onto lava rocks and just placed into the tank, then left on their own to grow (i forgot to take the initial setup photos, but it was just mostly bare lava rocks with bits of moss). There are still some patches of moss yet to fill in, but the growth rate so far has been quite encouraging. The ones on the right side of the tank get more light and flow than the left side, so they are growing noticeably faster... i'll have to start swapping their positions periodically to balance out their growth rates. Is your tank custom made crystal glass? Could you share the measurement of the tank? I don't have any Co2 injection in this tank... although water flow isn't essential, i've found that moss do tend to grow better with good flow and circulation. 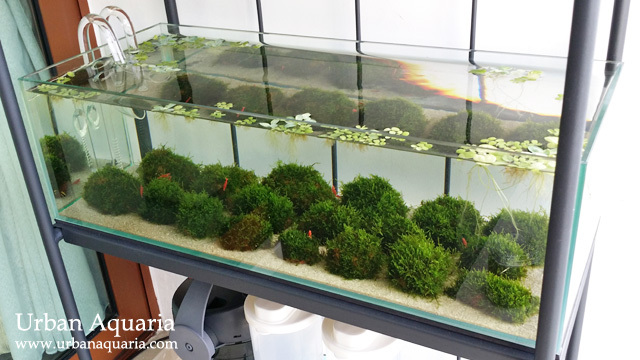 Liquid fertilizer depends on the setup, for a non-Co2 injected tank, the moss growth would naturally be slower so its nutrient uptake is also much lower, hence its usually not necessary to dose additional fertilizers, usually the waste produced by the livestock would produce more than sufficient nutrients for the moss growth.